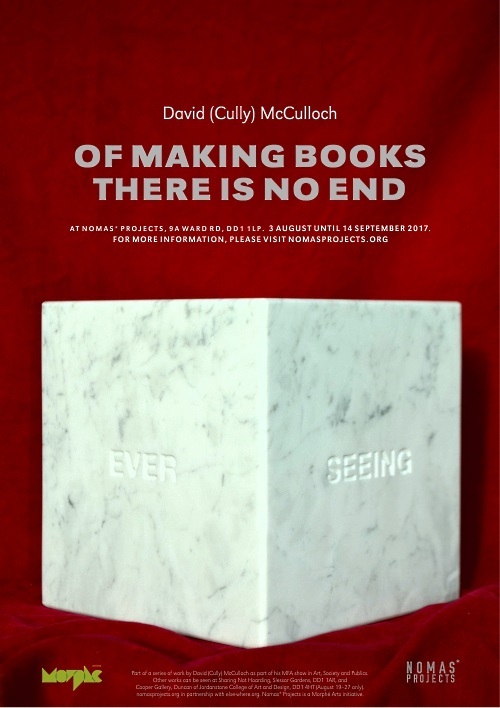 For the Nomas* windows I have made five marble sculptures using reclaimed plaques in the shape of books. Words are literally carved in stone giving them a sense of gravitas. However, as the object is seen as well as read, the combination of word and image as a means of communication highlights the complex and transient nature of knowledge and understanding. The reclaimed memorial plaques also serve as a potent reminder of death that we all must face. The human pursuit of knowledge in the interim, rather than deter death, only mirrors the nature of death in that both are never satisfied. My art practice is permeated by words and text. I consider these ephemeral forms of communication: propositions to explore the process by which a thought, idea or image is made visible. I am convinced that art is a relationship and not a commodity. I realise my practice as both maker and curator through multi-media formats and by programming experimental galleries Nomas* Projects and Sharing Not Hoarding. My curatorial intention is to provide an opportunity to consider new models of art practice beyond the white cube; spaces in which artworks and publics can generate a positive encounter of shared learning and observation. My artistic explorations are rooted in a theological framework. Taking into account aspects of culture and art, this outlook aids my response to basic human questions of worth, values, and communication, and invites consideration of life, reality and the artists’ role in society. My work explores changes in the historic relationship between the Church and the arts and investigates if a lost conversation between the two can be recovered. I am interested in the similarities and tensions found in the schema each provides to understanding humanity. This presents a dynamic counterpoint and a platform for developing ideas.